Cloud computing is storing and accessing data, through internet programs instead of using hardware drive. The Cloud is an Internet Metaphor. Microsoft offers online versions of Excel, PowerPoint, and word accessed via a web browser by installing a version of cloud computing. Few cloud computing technologies are Google drive, Apple icloud, Amazon cloud drive, etc. Why learn cloud computing at FITA? FITA is one of the best Cloud Computing Training Institute in Chennai that gives you strong theoretical knowledge in the subject with practical training. FITA has well-experienced trainers from various MNC Companies with 8+ years of experience. FITA offers you Cloud computing Training in Chennai at an affordable price with 100% placement guaranteed assistance and certification assistance for the students. Types of the cloud: Public, Private, and Hybrid. Delivering services from the cloud. Comparing Cloud Computing Vendor Product: Amazon, Microsoft, Google, and others. To Become familiar with service platform tools. We offer Cloud computing Training in Chennai at three different locations like Velachery, OMR and T Nagar which is close to Medavakkam, Pallikaranai, Saidapet, Thiruvanmiyur, Porur, Perungudi, Sollinganallur, Tambaram, West Mambalam, camproad, Anna Nagar, Mylapore, Ekkatuthangal, Choolaimedu, Adyar, Ambattur, Aminjikarai. 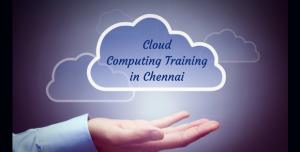 To become greater in the field of Cloud computing, join Cloud Computing Course at T.Nagar to strengthen your knowledge. Call at 98417-46595 to know more about the course.